The truth doesn’t just hurt. It kills. There are two groups who need to see Fruitvale Station. The first are young Black men. The second are the mothers and fathers of young Black men. Then everybody else. This has been a summer full of superheroes, special effects and stuff blowing up and that’s okay. This is what we expect a summer movie to be. Nothing too heavy, nothing that asks much of the viewer. It’s like eating a bowl of ice cream. Refreshing, tastes good and 30 minutes later you’ve forgotten all about. I’ve seen my share of movies this summer. Some good and some okay, but nothing memorable. I saw The Wolverine on a Sunday and Fruitvale Station on a Monday and only one left an impression and it wasn’t the one with Hugh Jackman’s ripped torso. I have nothing against non-think entertainment, but a steady diet of it is as bad as eating ice cream for breakfast, lunch and dinner and overindulging in non-think entertainment makes it hard to kick-start your brain when you need to. It seems an odd decision to release a movie this thought-provoking at this time of the year, but coming after the Zimmerman acquittal, Fruitvale Station is as timely as it is tough to watch. I didn’t want to watch what happened to Oscar Grant on the last day of his life. It hurt too much, but it would hurt even more not to watch. Like United 93, there is a “it’s too soon” quality to the film, but even more than reluctance was the need to bear witness. Grant was not a choirboy or a saint. He had his brushes with the law, he had a temper and he made some bad choices that hurt both himself and his family and director Ryan Coogler doesn’t hide Oscar’s warts from us. But it’s not saints or choirboys meeting untimely ends at the hands of vigilantes, street criminals and trigger-happy cops. It’s just ordinary brothers like Grant who get caught up in events beyond their control. Fruitvale Station won’t stir the sort of controversy of a Django Unchained, even though it is a clearly superior film. Unlike that fantasy where the Black man triumphs over the White bigots, in this case, the hero loses. There is no triumph, no revenge, no riding off to further adventures with his lady-love after vanquishing evil, because what happened to Grant on the last day of his life was all tragedy with no triumph. Yet even though we know going in what Oscar’s fate is we care about him because he is trying. He is trying to make the right choices after too many wrong ones. We want him to live to love his woman and his child and because we know he won’t, the unfairness of it all hit us like a slap in the face. My wife and I cried when the movie was over and she cried the next day when our son and daughter left to go to work. It hit her that hard and touched her that deeply. The Fear that our son or our daughter could be a Oscar or a Trayvon and walk out the door never to be seen alive again. How do you shrug that off and go back to reality TV and celebrity worship? You can’t. For us to understand why Grant’s death matters he has to be humanized for the audience to see him as something more than just another casualty on the urban background. Michael B. Jordan plays the doomed Grant as a young man trying hard to make good choices and stop making bad ones and finding it hard to do. It’s a stand-out performance as is Melonie Diaz as Sophina, Oscar’s exhausted girlfriend, Ariana Neal as their daughter and Academy Award winner Octavia Spencer playing Grant’s mother, Wanda who shows her son what “tough love” means. Spencer also claims a producer credit along with fellow Academy Award winner Forest Whitaker and major props to both of them as well as everyone else who backed this project. Too often the complaint is, “We need to support good Black movies.” Well, here’s a great Black movie. Black director, Black stars in a story about a Black man, so where y’all at? Why aren’t there more fannies in the seat? Why is Fruitvale Station mired in 13th place with a paltry take of $11 million dollars behind even R.I.P.D., one of the biggest bombs of the year? I knew this wasn’t going to be a Number One movie in America, but damn, I hoped it would be doing better than this. I know summer is a time for mindless entertainment, but seriously, folks. For heaven’s sake, if Black people don’t support this movie, who the hell is going to? It might be premature to proclaim Fruitvale Station as the Best Movie of the Year, but I’d walk away from any conversation of what are the best movies of the year that doesn’t include it. You need to see this movie if you’re Black. You need to see this movie if you’re a human being. You need to see this movie if you give a damn. They should be smiling. They did it right. Thank you for the review. We have been waiting for a showing, finally it is at a theater near us. One showing a day at 11am. One, per day. Pitiful really. I hope you get an opportunity to see it Valentine. Please let me know what you think of the movie if you go see it. Now, there was a time 20 years ago, I could stay up that late for a movie. I am closer to 60 than 50, I simply can’t do it any more. I fired off a very nasty letter to AMC, who apparently think there isn’t anyone above the age of 25 who might want to see this movie (thus the late showing). We looked on “On Demand” not there either. So we are just awaiting when it will be available. We were both terribly disappointed. Can’t wait to see the movie, looks very interesting! It is a tough sale. The truth hurts and people will leave the theater without the thoughts of the hurt. Do we want to spend this type of money to not feel good, to know the truth that things sometimes go wrong and people pay consequences. Is it fair? Probably not and that is the real wrong of it all. How we make it fair is the question and not everyone is ready to sit down and have that conversation. In a way, it might have been better if Fruitvale Station had been released in the fall with the more “serious” films, but coming on the heels of the Zimmerman acquittal, THIS is the right time for this vitally important movie. I understand why many find it difficult to watch, but I sincerely hope they get past that and support this powerful movie. Otherwise, Black folks can’t complain when the next Tyler Perry/Madea hot mess comes rumbling down the track. Well, I sincerely do hope you find your 90 minutes in your busy schedule to see this. It may hit you hard, but it’s going to make you think and that’s quite an accomplishment in our dumbed-down culture. Please let me know if you see the movie and what you think of it. I’d love to read what you thought of it. Thanks for reading my blog. May I ask, how you found it? I will see the movie and also give U my review of it. Found U cause U were Fresh Pressed.. I’m not usually thrilled about the pieces featured in the FP section . But when I saw it was a review on the Oscar Grant flick I couldn’t resist peeking . Very glad I did ! I too, saw Fruitvale Station and I thought the film was marvelous. I thought the acting was wonderfully done and was very moved by the story. I went to see the film with one of my close friends – I am Black and she is White. During the movie, we held hands and we were both on pins and needles with each scene, because we feared for Oscar’s impending doom. By the end of the film, the both of us were weeping. Even now, I can think back to how hard and painful it was to see Oscar’s story. My heart was broken for his girlfriend, for his mother, and most of all for his baby girl. Thank you for writing such an honest blog-post about the film. I am glad to know that my friend and I were not the only people moved by the movie. I really enjoyed your review. I have to say that I must agree this is a movie worth seeing;however, this is the reality that we live in. No matter how much we have progress the issued of the Zimmerman trial and Oscar’s tragedy in the these are situations that all blacks will face. It is up to us as a people to be more self aware of our surrounding, the environment that we live, and the struggles that we will face to meet them head on prepared for the harsh realities and molded by our forefathers to embody the men and women which they struggled so hard to give better lives to. Indeed it is sad that black people live with the knowledge that he or she will experience racial profiling, discrimination and any level of bigotry in their lives, but it is our reactions to these encounters that define the how we will progress. thank you for your honesty. Your insight and your perception on what you took from this movie. Great review. I plan on seeing it, especially since Michael B. Jordan is in it. (He’s a star.) Cheers! Great review of a great film. I was waiting for this movie to come ANY where near my state to view it. I thought due to demographics in this metro area it would show up in a least one chain theater. To date I know of it being nowhere–EXCEPT–the independently owned art theater. They’ve held it over for another week. I saw it in the middle of the week at a 2:15 show ALL by myself–as in not another soul in the large viewing room despite a 4 star rating by the local movie guru. Afterwards the staff said that the film does well in the evenings and weekends. So that was reassuring. You’ve been very candid,-hence, I will be too, I’m white, originally from the South Side of Chicago. Yes, young African American men need to see this film. But, a LOT of white America needs to see it even more so. I have spoken to so many people who have no idea who Oscar Grant was or what happened to him that, frankly I’m amazed–like did they NOT pay any attention at all when there were protests and riots due to this senseless shooting at a BART station? Apparently not. This film is about a lot more than Oscar Grant–it presents so many issues relevant to young people confronting the same sorts of issues–and it speaks for all the other stories that have not been told. The acting is great. The script is solid. It focuses on what was lost when Grant died–especially for his daughter. Fathers and daughters–that’s a whole other avenue. Perhaps the most important thing this film portrayed was the Love–in spite of all the mistakes and hurts and problems–there was love flowing in his family. Why is it not being seen by more people? I’m not sure. Maybe they’re afraid of something like the truth? You’re right, there are no superheroes–there’s just each and everyone of us struggling to live well in a hostile world. All too often it’s a deadly one too. “fruitvale station” reminded me of “crash” for better and for worse. it’s entertaining/moving in a way that as you point out, aspires for more than a lot of what we usually see atop the box office. still, it falls short for me by playing too much on emotional notes (sometimes conveniently crafted emotional notes) to superficially address issues. while this premise seems to be one of the driving forces behind the film, i disagree with it. an unarmed young man, handcuffed, lying face down on the ground, was shot in the back by a police officer. that alone makes oscar grant “more than just another casualty.” catering to an audience that needs to see grant console a wounded dog or pour his drugs into the ocean before it acknowledges his humanity and the accompanying attack on all of ours (black, white, whatever) that fateful night is a waste of time. instead of trying so hard to convince people that a human is a human, i wish coogler gave us more about the actual shooting & its aftermath. for one, the possibly racist undertones of a white cop killing a black man in the aforementioned manner made grant’s death a national story (and a hollywood film for that matter). surprisingly though, the movie does little to address how much of a role racism actually played in the shooting (some background on the shooter/cops involved would’ve helped). also, since the oscar grant story doesn’t really end with his death, something on the subsequent protests (beyond the one heart-pulling shot of tatiana at a “justice for oscar” rally) and the trial (beyond the quick summation written at the end) was missed. in what turned out to be a relatively short film, there should’ve been enough time to share the desired portrait of who oscar was while also providing a more substantive picture/commentary of why he died, what happened next, etc. than we actually received. I really liked your review of the movie. Just before it opened I heard an interview with the young director, (only 27), Ryan Coogler, and he was so compassionate in the way he directed the movie and Michael Jordan took such care to honor Oscar’s memory, I was obsessed with seeing it. When I saw it, I loved it. Many people say they can’t go see Fruitvale because it’s too soon after Trayvon, but there’s really no way you can”get ready” for a movie like this. You just have to go. The director added such a sense of humanity to the snapshot he gave of the last day of Oscar Grants’s life and elevated him from the label of “another victim killed in a senseless shooting” that we always hear on the news. The movie won’t be in theater long, I hope more people consider seeing it. Sorry for the long comment, but I just feel people of color really need to support each other. I loved your article. Honestly I had never heard of this movie until reading your article. Just by reading your article makes me want to go see it. Thank you for sharing your opinions on this movie so that the rest of us could get a grasp for it too! Thank you. I hope you do go see this movie. It is an impressive debut for director Ryan Coogler and the actors all do an excellent job as well. Thought-provoking’ movie! Amazing review. I will make sure see this film. 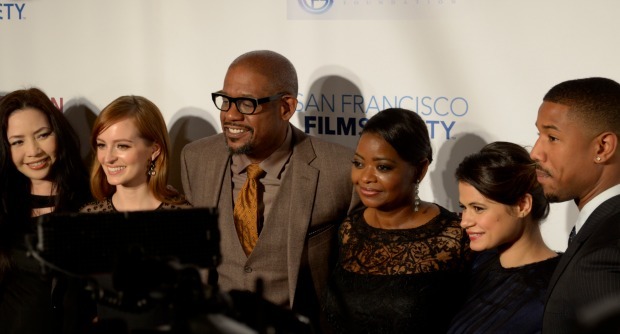 Academy Award winners Octavia Spencer and Forest Whitaker had a hand in it, so I know its the bomb! What a writeup! I will definitely need to check this out. Did this take place in Oakland? It was a good but depressing movie. Its sad to know that this is still a reality after all that people of color have gone through over the years. Even after knowing the outcome I still wanted Oscar to live and turn his life around…but of course thats not the way this works. I saw fruitvale station this past weekend. I was tossing and turning all night because my overall perception of things was completely rocked after watching the movie. However, I am glad there are people out there who will use whatever talents or careers they have to bring awareness or justice. I love this movie. when we saw the film there were an impressive number of father and sons. Not one dry eye leaving the theater.. I haven’t seen the film as yet and didn’t plan on doing so. I thought it’s another beat it over your head story about injustice. The kind that means well but doesn’t do anything different than the others before. The kind that makes a saint out of the “victim” and sinner of the “white abuser”. Those films I feel do more harm than good because its about sensationalizing rather than getting something accomplished in terms of new thought or change of thought. But this film really seems to be striking a cord and provoking dialogue and thought. So perhaps I will see it. No saints and no evil White people either. Just a flawed “hero” and a situation that got escalated way out of control. The lines are not drawn like a crappy Hollywood movie, Ms. Hudson. Just like real life. I hope you do go see this movie. Agreed with Jeff, I’m from Oakland and one of the things Coogler tackles best in this film is the way he portrays the nuances of Grant. He is no saint, no devil, just a dude in East O trying to get by who doesn’t deserve the end that came to his life. I know guys and I know ladies who act worse than him and they still don’t deserve the death he received. The Bay can be a haven of liberal morals for some, but this film shows that even the most open of places can still be a racist pit for people of color. Perfect timing in the wake of Trayvon. A group of kids i work with went to see this movie… (i opted out and went to see the feel good movie Turbo) by the end of the movie all of them were sobbing uncontrollably. they were both hurt and confused and couldn’t quite understand why the events in the movie played out the way they did. i spent an hour and a half trying to console them.. but all i seemed to be doing was continuing to crush their spirits with the harsh reality of the world that they live in. I felt awful.. so now i must see this film. Not to make light of the situation, but I guess I gotta ask…did you like Turbo? I’m also surprised kids would want to see Fruitvale Station. It’s not exactly an easy watch. I did enjoy turbo. it was really good. It was mainly the teenage girls who thought that they were too old to watch a kiddie movie so they chose this. i don’t think they fully understood what it was about or had even known about the story before going to see the movie.. Loved this movie saw it on my birthday last weekend. You explained it perfectly. I cried like a baby the truth cuts like a knife it hurts so bad to know that one by one we are being snatched off this earth. This is a great article. I saw the movie and thought it was extremely powerful. Everyone in the theater was silent, save for a few sobs, as they left. I hoped more people would go see the film. Hopefully WordPress bloggers will be inspired to see it after reading this. I saw Fruitvale Station and I cried too. I absolutely agree with you. It is a movie that everyone needs to see. It was powerful and heartbreaking to see him go through his ordinary day, not knowing that it would be his last day alive. It also showed how much a person’s everyday actions can reveal about his character, like a trip to the grocery store. Great post. I was too emotional to blog about Fruitvale Station. I was afraid I wouldn’t do it justice. Good review. Saw the film a couple of weeks ago. Example of how things can quickly spiral out of control. If folks could take a step back, check their ego, breathe, and count to ten, a lot of these issues could be more peacefully resolved. Easier said than done. Wonderful review! I haven’t seen it yet, and after reading your review I feel a little guilty not supporting it.